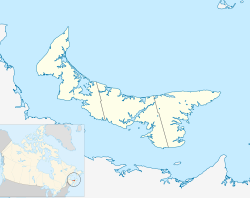 Souris is a Canadian town located in Kings County, Prince Edward Island. It is situated near the northeastern tip of the province. Souris was founded by Acadians in 1727 as a fishing settlement at the mouth of the Souris River. These early settlers experienced several plagues of field mice in the surrounding area during the 1720s-1760s (the name is French for "mouse"). Since the 1960s, Souris has hosted an interprovincial ferry terminal for the service to Quebec's Magdalen Islands. The MV Madeleine is operated by the Coopérative de transport maritime et aérien (CTMA). 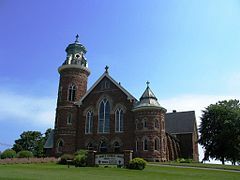 The town has many well-preserved historical buildings, including the Matthew and MacLean Building, Souris Customs House and Post Office, and the McQuaid Building. The economy of the area is dominated by the seasonal industries of fishing and oysters, agriculture and tourism. There are also several industrial businesses and a good retail sector. The town is home to banks, pharmacies, cafés, restaurants, gas stations, a grocery store and other independent businesses. Souris is home to two schools, serving grades K-12. Souris Regional School teaches students from grade K-12. Ecole La Belle Cloche is Souris' only Francophone school and teaches students from grades K-12. École La-Belle-Cloche is situated in what used to be Rollo Bay Consolidated School, three minutes west of Souris in Rollo Bay. Souris has venues for soccer, baseball, basketball, rugby, hockey, football, ringette and other similar sports. There are also several parks in Souris. Kitesurfing is popular in Souris and nearby beaches. Souris Beach is an intermediate level beach, and has good wave conditions when winds blow from the Southwest. Nearby beaches of Little Harbour, Basin Head, and other nearby beaches generally have good conditions in southwest and southeast winds. Wikivoyage has a travel guide for Souris. This page was last edited on 26 November 2018, at 13:55 (UTC).